In unsettled times, gold remains relevant. It is an asset of the last resort. It comes in handy in times of personal and social crisis. If you have amassed a fortune, it makes sense to geographically disperse it to ensure that all eggs are not in one basket. Moreover gold tends to be a good hedge against a depreciating currency and can be freely bought and stored abroad to be converted to any currency of choice as needed. A further plus is the lower gold rates abroad. So, for readers who have written in to ask about alternatives to BullionIndia, if you can deal with larger quantities of bullion,there is a better option: BullionVault. The best gold and silver deals are listed on the international professional bullion markets—where most trade and government industries and banks trade—not the Mumbai Wholesale market. But this market only deals gold in 400 oz good delivery bars, which cost around $500,000(3crores) each. The silver bars weigh 1,000 oz. This puts the best prices out of reach of most private individuals. Further good delivery bars are stored in accredited vaults. The vaults have a high minimum monthly charge, so you would need about 15 of these 400 oz gold bars, worth around $7,000,000(43crores), to make it economic for you to open an account yourself. The large starting balance tends to make the system inaccessible to many private customers. With the help of online trading such as BullionVault, you’re able to obtain information from international gold markets and own gold bars. It’s a good thing that you’ll also enjoy cheaper prices in terms of storage. So whether you are purchasing or selling, expect to find top notch international gold prices. BullionVault offers none of the free storage and zero commission on sales that BullionIndia offers. But the small fees are reasonable if you are dealing with larger amounts. You will make back these small expenses in the better rates you get. Also you will be offered priceless security and guarantees. The gold stored in the company’s vaults are kept in the purest form, which in turn translates to high rates when sold. Good delivery bars are manufactured by accredited refiners who are regularly subjected to double-blind tests by independent assayers. The bars are stored in accredited facilities and are transported only by accredited couriers. They are the only form of gold automatically trusted upon receipt by professional buyers. 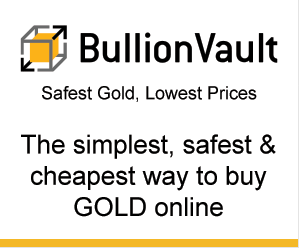 Since its conception in 2005, BullionVault has been a world leader in online trading. In fact, it was ranked number 11 in the 2012 SundayTimes TopTrack 250 league table of Britain’s leading private companies. BullionVault has won The Queen’s Award for Enterprise twice. First for Innovation in 2009 and then for International Trade this year for growing overseas sales by 140% in three years. This award is conferred by the UK’s Prime Minister on behalf of the Queen. Opening a BullionVault account is pretty simple and quick. It’s free and there’s no pressure to trade right away. Additionally, fund transfers are made efficient. The first pleasant surprise you will find is that while a majority of banks add 3 to 4 percent over the visa rate to convert your cash to foreign currency, at BullionVault, you’ll get a very good rate, because there gold is easily converted to cash.